Renovation and Restoration - Fairfax Hall, Waynesboro, Va. In 1996, the property now home to Fairfax Hall was sold by the Gates/Nash families at auction in three tracts with the largest track being 14 acres with the three principal buildings. The front lawn was sold and remains in private hands with the purpose of keeping development away. The riding rink section was sold to a developer who constructed D Street and sold the lots for small houses. The families had sold off other parts of the property over the years. Some have been well preserved and others have been inappropriately developed. The main property was marketed for several years, and a few foreign-based schools considered it for use as a school. The principal reason that the property was not reused for any purpose was the need to completely renovate the functional parts of the building. The building contains 57,000 square feet. With an estimated renovation cost of $100 per foot, no economically feasible uses existed. In 1997, Bill Hausrath approached the Waynesboro Redevelopment and Housing Authority about developing and restoring the property as an affordable housing project for seniors using tax credits as a source for the majority of the funds. The Authority agreed to partner with Hausrath, and Bill Elsbree of the Finch Group of Boston was brought in as a tax-credit consultant. Waynesboro City Council agreed to support the project in December of 1997, and an application was made and funded in 1998. WRHA took ownership of the property in December 1998. There were many delays in obtaining the full tax credits available and, although demolition was begun in 1998, construction did not start in earnest until December of 1999. Mathers Construction was chosen as the general contractor with Dennis Pyell and Paul Childress as managers. Wade Sites finished the project as construction superintendent. Frazier & Associates Architects with Carter Green as architect, and Mike Riddle as principal draftsman, did all of the architectural work as well as the historic applications. 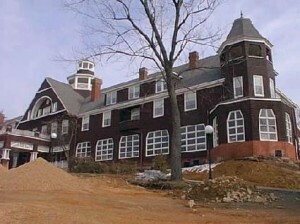 Early photos show that the Brandon was built as a two-story building, and the third floor was added for additional dormitory rooms after it became Fairfax Hall. Unfortunately, the supporting structure was not sufficient to handle the additional loads and several supporting beams began to fail almost immediately. Members of the Class of 1950 recall that there was a significant drop in floor level on the second floor and that the floor was “wavy.” They were told it was that way from previous classes having had too many water fights. – The second floor above the dining room and continuing down the hall to the viewing porch was visibly out of level. Early demolition revealed that a main structural beam had failed, and the hall above the viewing porch was near collapse. The floor of the 2nd floor corner room had been constructed improperly and sagged considerably. A new floor and support system was required. – The entire north viewing porch area had suffered from water damage, poor repair work and structural failure. At demolition, the entire section was ready to fall away from the building. – The cupola’s weight and the addition of the third floor had caused the lobby to become visually out of level. It needed leveling of 4″. Hill Brother’s House Movers were called in to orchestrate the placement of steel beams and new supports so that the lobby could be leveled. An intricate support structure incorporating additional support from the new elevator shaft, new steel beams in the floor and additional support beams that are hidden in the renovation work were necessary. – The main beam of the front porch had failed. It was broken and the “why” as to why it hadn’t collapsed was a mystery. Much design and thought went into the design of a new beam. – The second floor over the kitchen had been off limits to girls since the 1970s. It required rebuilding of the plates and sills on the first floor, new supports, and new flooring to return the rooms to safety and level. – There were many other areas where ignored water infiltration had resulted in floor systems, doors and windows being rendered useless and requiring replacement. – The rooms above the dining room were divided with a unique and advanced steel beam support system. The beam, a triangular structure, continued up into the wall structure of every other wall of the rooms on the east side of the hall. Their discovery in demolition required a redesign of the apartments and structural stiffening by the addition of additional timbers to carry the weight away from the center of the dining room. The redesign actually improved the size and flow of the apartments. The building has been occupied since February of 2001.